Feb. 7: Debi Thomas. 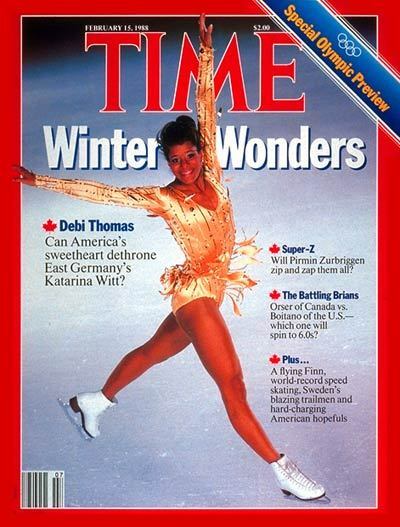 Today’s Black History Month feature is figure skating champion, Debi Thomas. Thomas was born in 1967 in Poughkeepsie, NY but was raised in San Jose, CA where she began figure skating at the age of five. By her teens, Thomas was dominating. At the age of 19, Thomas won both the U.S. and World Championships, making her the first African-American to hold either of those titles. Amazingly, Thomas claimed these titles while being a pre-med student at Stanford. After battling injuries in 1987, Thomas was able to claim silver medals at both events, and prepare for the 1988 season. In 1988, with all eyes on Calgary and the rivalry that had developed between Thomas and the East German skater, Katarina Witt; Thomas grabbed the bronze medal, making her the first African-American to ever claim a medal in the Winter Olympic games. In that same year Thomas also reclaimed the World Championship title. As if dominating on the ice wasn’t enough, after retiring in 1988, Thomas graduated from Stanford in 1991 with a degree in engineering and graduated from the Northwestern University Medical School in 1997. Today Dr. Thomas has a thriving practice as an orthopedic surgeon in Virginia where she specializes in hip and knee replacements. After being inducting into the U.S. Figure Skating Hall of Fame, Dr. Thomas served on the U.S. Olympic Committee and supports organizations like the Make-A-Wish Foundation and the Parseghian Medical Research Foundation. How one woman has fit so much into her life will never cease to amaze me. She’s living proof that brains, brawn and beauty can come in one package. Thank you Dr. Debi Thomas for contributions to sports, black history, American history, women’s history and medicine! !